The sunlight shone through the window, a rarity on an afternoon in monsoon season, and illuminated the classroom floor. It revealed a creature ensconced in the grime of the floor. The translucent wings of a lowly cockroach coruscated in the sunlight. It was almost as if it was waiting for the sun on its back to get on with its business, as it almost immediately began to scurry along the floor of the classroom. I watched it from my seat, high above the tiny creature. It ran around the classroom floor, on the hunt for food. Anything would do for this insect. It wasn’t picky. It was almost as if it knew its place on the food chain – right down at the bottom. Rubbish would be a feast for this scoundrel. The movement of its legs in a synchronized manner entranced me. The cockroach moved with purpose. It looked like nothing could stop this six legged machine, antennae flaying in the air like the mane of a mighty war steed. However, my thoughts on the cockroach were a far cry from the truth which I was about to witness. As the tiny insect moved along the floor of the classroom, a loud scream pierced the air, as does a murderer’s knife, his victim’s heart, shattering to pieces the peace of the afternoon. 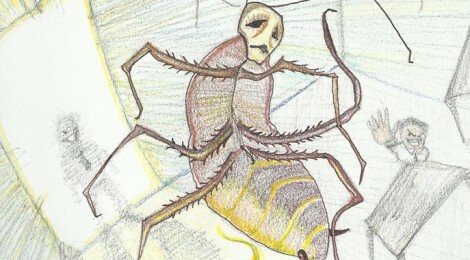 A girl, sighting the cockroach running helter-skelter at her feet, had screamed bloody murder. Needless to say, she drew the attention of a crowd, who accompanied me watching the tiny, red devil. Soon there were a dozen eyes locked on the cockroach. This would be a crime the cockroach having committed, would pay for with its life. The roach began to run with great speed for a creature its size. It had realized that something was amiss, even though it didn’t understand why. While it was executing its escape, thick clouds were rolling in, darkening the sky. The cockroach caused great panic as it began to surge through the floor, nothing stopping the insect as it maneuvered through the cracks and crevices of the terrain, evading many a flying foot hurled at its miniscule body, the darkness brought by the clouds coming to its aid. Was God on this insect’s side? Other girls began to console the victim of this winged fiend. They assured her that no harm would come to her from the creature a thousandth her size. While they did this, the boys were up in arms and were on the hunt to track the villain who seemed to have evaded every eye on the lookout for it. No sooner had the boys contemplated giving up the hunt, than the criminal was spotted. It was hunted like prey, the predators being the boys with a fervent desire to avenge their classmate, or at least so it would logically seem. I was still watching the story of this cockroach’s short life unfurl before me. I couldn’t help but wonder if the predators knew what they were avenging, if they were aware that they were avenging something at all. That didn’t matter once the hunt was on. All that mattered was capturing the cockroach. I hoped in all sincerity that the creature would escape its hunters, but my hope, floundering at sea, was dashed against the rocks of reality. One of the boys had caught the cockroach in his palms. This would be the insect’s jail while the authorities contemplated its trial for the crime it had committed. There would be no trial for this cockroach, for as far as its captors were concerned, this creature was as guilty as they come. All that was left was for them to decide the roach’s punishment, which wasn’t too hard. The tiny cockroach had committed an unspeakable crime. It would seem that the vox populli was louder than reason; and it was demanding death for the criminal. Its captors were its judges, jury and executioners. There was no reasoning this decision. There was no need to. After all, it was a lowly cockroach. Attached to its body were not just legs and antennae, but guilt. What need would there be to hear a creature that was exuding guilt, its crime – being a cockroach – a sinful, loathsome, filthy insect which was unworthy of being afforded dignity. Its innocence was simply unfathomable and it had (as it had been decided for it) nothing to say on the matter. The insect was to be put to death, and what better way to do this, than by immolating it. One of the boys held it by the antennae outside the window, the red insect squirming, pleading for mercy. The other pulled put a match box and light a match stick. He brought the flame closer to the hapless cockroach. The flame touched it and began to eat away its wings and legs. 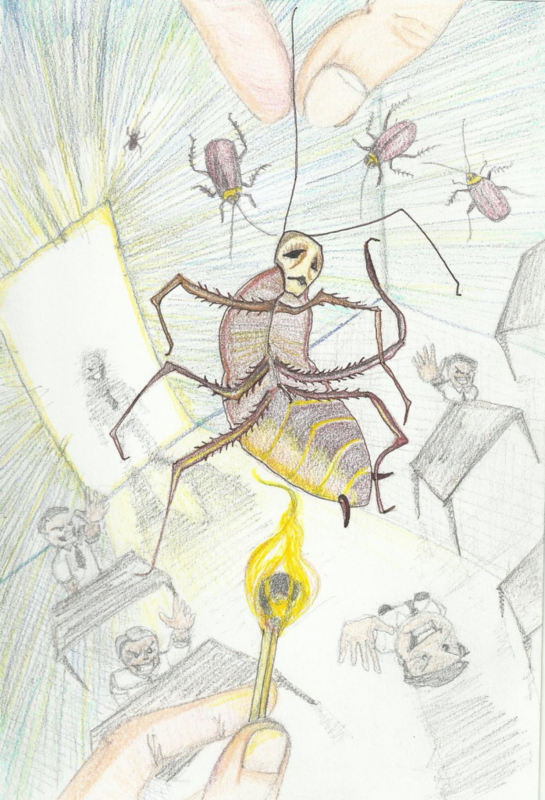 The flame soon engulfed the cockroach, whose corpse was now thrown on the window sill. The boys heaved a sigh of relief and satisfaction at their achievement. They’d rid their classroom of a notorious deviant, who now lay there on fire, in full view of its punishers. It then began to rain as the monsoon could not hide. The water quenched the earth and her inhabitants, although it would seem that the blood of the cockroach had achieved the same in its punishers, only moments ago. A few drops of water fell on the half burnt cockroach, dousing the flame. It was too late. It lay there, dead. The water had brought an end to its story on earth, one that warmth and had started. I watched all this happen and did nothing. It was over before I even knew it had begun. The teacher then came in, and we continued to educate ourselves. Abhirup Bangara is a law student based in Bangalore. He is passionate about reading, drama being his poison, and enjoys the works of William Shakespeare and George Bernard Shaw. He also enjoys creative writing and short story writing.